Wilder Kaiser or Kaisergebirge („Kaiser Mountains“) is one of Austria’s most popular climbing destinations. In 1977, international climbing history was written when the route „Pumprisse“ (7th grade) at Fleischbank-Pfeiler was established. Popular alpine routes such as Totenkirchl, Predigtstuhl or Fleischbank trigger both respect and ambition. 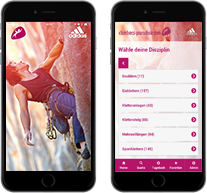 Additionally to alpine classics, many sport climbing routes in all difficulty grades were established. While the climbing garden Kaiserklettergarten is recommended for beginners, Schleierwasserfall provides some of Europe’s most difficult sport climbing routes. This climbing hot spot is recommended for both beginners and experienced climbers who search an individual challenge on rock. Aside from sport climbing routes, the Kaisergebirge also offer multi pitches, via ferratas and climbing gyms. The Ellmauer Kaiserklettergarten is very family-friendly. All topos are online available for printing on Climber’s Paradise Tirol! Why are the “Kaiser Mountains” called like this? With a bit of fantasy, you can recognise Charles the Great’s profile between the Treffauer and Ellmauer Halt Peak. The villages Ellmau, Going, Scheffau and Söll have a lot of outdoor activities to offer – both in summer and winter. Enjoy swimming in the Kaiserbad in Ellmau. It is an experience for both old and young. For information about the most up to date offers of this indoor and outdoor bath, have a look at the website! In Ellmau the TV series „Der Bergdoktor“ was filmed. You can visit the Bergdoktor office in Ellmau. Cool down in the lake Ahornsee in Söll after climbing. It offers everthing for a successful summer day with the whole family – from a beach volleyball court to a children’s pool. Hike up to the Grutten Hut in the Kaisergebirge. It is an ideal starting point for alpine hikes up to the mountain peaks and the via ferrata Klamml. The restaurant Memory in Ellmau is well known for its delicious mediterrean cooking – particularly its pizza.